2015 Q1 is a double issue, due to a number of factors, but we hope you will agree the small wait is well worth it. I am extremely happy with the content and I'm sure there is something of value for everyone. Many of you do not personally know me, but I just wanted to throw a thought out there about the NACA magazine. First I want to state, this is by no means a "slam" of sorts, but was more curious than anything about a particular issue. The last two covers were of "non-USA" based anglers on the covers of our beloved magazine. I have the up most respect for both of them as anglers and have learned a lot from them, but am I the only one that feels the "North American" magazine should at least have an "American" fish on the cover? Our country is obviously still in its carping infancy stage, but isn't this the place to show what our country has as far as specimen carp go, especially on the cover? Is this slightly hypocritical to have a UK angler with a UK fish on the cover? I'm not trying to stir any pots and get people all crazy, just asking some simple questions. I appreciate any respectful responses to my inquiries. You may not mean to slam the issue or stir the pot, but that's what you are doing. Please take a close look at both magazines and you will see that over 90% of the content is regarding US anglers and CAG Clubs news and events. If the magazine was only available to members then it would only feature members, however one of the remit's of NACA is to capture new members, get more eyes on CAG and also encourage new sponsors to join and support the club. As Editor in Chief I have no bias towards any nationalities or countries. The simple fact of the matter is that the two cover shots were the best shots available to me and ones I thought would give the magazine the most exposure. Simply put no American anglers submitted a picture or pictures up to the standard required of a cover shot. To follow-up on this point, I have asked several times for member contributions, but it is usually the same people who get involved. If someone sends me a shot of high enough quality or captures a note worthy fish it will go on the cover. I go with the best shot available whether US or European. Whether you think I am biased to the UK anglers or not (yes I am originally from the UK, but been in the US for 15 years) is your opinion, but I am only interested in quality and improving the content of the magazine which I hope I am doing. Please, please, please send in catch pictures and articles if you are a CAG member. I would love to have more contributors sending in quality material which will save me having to source my own content and contributors. The magazine is great and I'm sure everyone can attest to that, The content is well rounded and it does look to be improving with every issue. I am not denouncing that for a second and everyone involved is doing a fantastic job. My "simple" question was answered by you stating " The simple fact of the matter is that the two cover shots were the best shots available to me and ones I thought would give the magazine the most exposure". So in essence, the USA anglers need to step up there photography skills to have a shot at displaying an "American" fish? Does the pic have to be a recent fish? I'm sure with the thousands of anglers over the years there are plenty of nice pics of fish or something "carpy" that is worthy of American representation from the CAG archives? Best issue yet - keep them coming! This is issues is one of the greats. Thanks all who were apart of it. Great magazine, really appreciate all the hard work that goes into this! I don't know. You get two of the biggest names in carp fishing to do this for FREE and people whine. Lets go back to a 1 megapixel photo of a pod or a pack on the cover. By far the best edition from front to back. 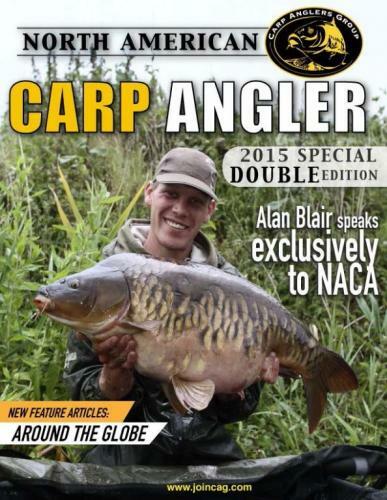 More of the same please Dean.....its about time NACA caught up with the times and looked like a proper and professional carp magazine. Mario, I am not struggling for content and if the last 2 editions do not show you that I am pro-active and chase down good contributors than I unsure what else I need to do!! I have lots more content coming, some from outstanding writers but I have made it clear on several occasions that I would love to have more contributions from CAG members. I'm not sure why there is an issue about the cover shot(s) as NACA has had European anglers on the cover before as well as anglers from other parts of the world other than the USA. My goal is for quality and if I get quality pictures from US anglers I will most definitely use them. Dean, high quality issue for sure! NACA keeps getting better and better! I was also disappointed to not see more North American content, I don't place any blame on the editor or volunteers that made this issue possible but rather on the North American anglers themselves. These last couple naca's have been the slickest looking things CAG has ever put their name on, they look and read just like the e-magazines released by major carp tackle companies. This NACA is a truly respectable product, not something an outsider could easily dismiss as some rag trying to glorify a "trash" fish by any means. Dean you have set the bar high, if American carp anglers want their only carp magazine to be more American then we need to take this as a challenge to step our game up. Thanks for the kind comments Hawkeye. I hope to keep the content high and keep on improving the lay-out. If you take a close look at this issue there are only 4 articles from non US anglers and one of them is a CAG member (Marcus). The rest of the content is CAG based news and information (Big 4, ATC, Mid-west regional, FFF, etc) and articles from US anglers, most of who are also CAG members. Again, I would love to have an excess of quality material from US anglers and my goal has always been to have at least 75% of the content focused on the US. I would love to see some articles regarding fly fishing and pay-laking and hope to get contributors on board for these. What I will say is that I have lots of irons in the fire and if half of them pan out we will continue to get quality content from US and world contributors alike. The better the magazine looks the easier it is to get contributors and sponsors and move towards making NACA self supporting. Keep the comments coming, good or bad as this is YOUR magazine and I welcome input. Just finished reading the article about Australia. Loved it. This puts wading and night fishing in a whole new perspective! Overall, great job, Dean and Sal. I really enjoyed the diversity of coverage and perspectives...reflective of the carp angling 'scene' over here I think...and it not being overloaded with product placement and hard sell is always a plus for me...Great work Dean and Co..Keep it up! I certainly think that those cover shots have generated a level of interest outside the USA amongst carp anglers who may have never previously read NACA because the previous cover shots did not appeal enough for them to read it. that is not a dig at previous editors, I think Mario and Santosh did a great job also and I was happy to contribute to previous magazines. As a purist for me the cover shot needs a carp on it, and one that will entice the reader to look further. I also think that this is a great opportunity for CAG members to 1. get some top quality material in the magazine to promote either themselves and/or the sport, and 2. attempt to capture a picture good enough to get on the cover. I don't think we need a big named European angler on the cover each edition, but I think Dean has done a great job in taking NACA to the next level, and this was one strategy that did it. Also do not forget this was a winter edition....when most of us are not actually out fishing which means content is harder to find. This is also the same with the Euro and UK magazines in winter as they too struggle for content and catch reports in the colder months. All yours to play with guys. Just think Diggs has a point and I would guess that the majority of the CAG members want to see a North American scene on the cover, with or without fish, I don't really care either way. It's a great opportunity for the CAG members to put themselves in the spotlight so to speak. I would try not to copy the 20,000 other European magazines out there. Dare to be different. But you guys are right, if no members submit proper pics it's a mute point anyhow. Members: It's your magazine, paid for by your membership contributions. If you want to be in it, be proactive and help out the NACA staff. Another option to consider if you'd like to have some influence and work helping get that content you can volunteer as an assistant editor? As a volunteer organization CAG is always in need of people to help pull the wagon. I loved the NACA. It was a great read from the start to the finish. CAG as a group needs to understand that there is strength in numbers. We need to join with carp anglers from around the world to demonstrate to our state leaders that carp fishing is a global sport and that our sport can and does bring anglers from around the globe to fish our waters. That is the only way we will ever get protection and recognition for carp in our country. Please keep in mind that we have members in our group from many areas outside of the USA. Those covers will help attract other carp anglers and carp sponsors from around the world. The NACA is and always will be about North American carp fishing first, these covers and stories from abroad just add a little flair to the coverage of our sport. One thing about having both American and European articles and pictures is that they indicate the pursuit of carp across the globe. If we could get carping as big as bassing, we would be home free! I'm having problems viewing this on my iPhone (my only option). Anybody have an idea to correct this? Just says safari cannot download. Plus it require flash to view the PC version.